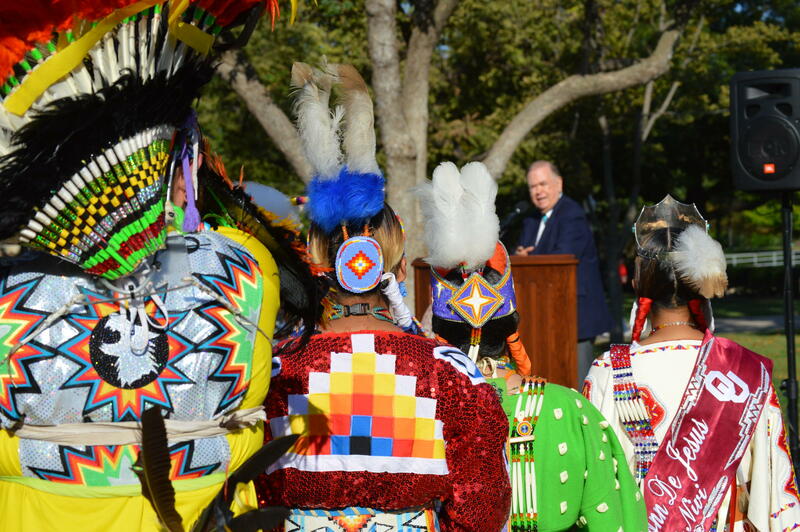 University of Oklahoma President David Boren announces the first Indigenous Peoples' Day Monday outside the Bizzell Memorial Library on the south end of campus. A crowd gathers on the University of Oklahoma's South Oval Monday to mark the first Indigenous Peoples' Day on campus. 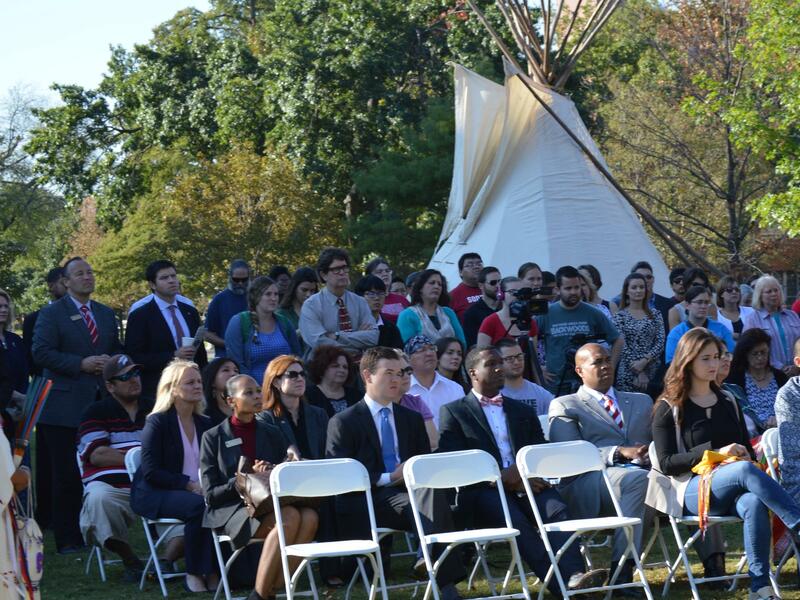 Native American students in traditional dress listen as University of Oklahoma president David Boren marks OU's first Indigenous Peoples' Day Monday. Native American student Raven Morgan, dressed in a traditional Southern Cheynne elktooth gown. 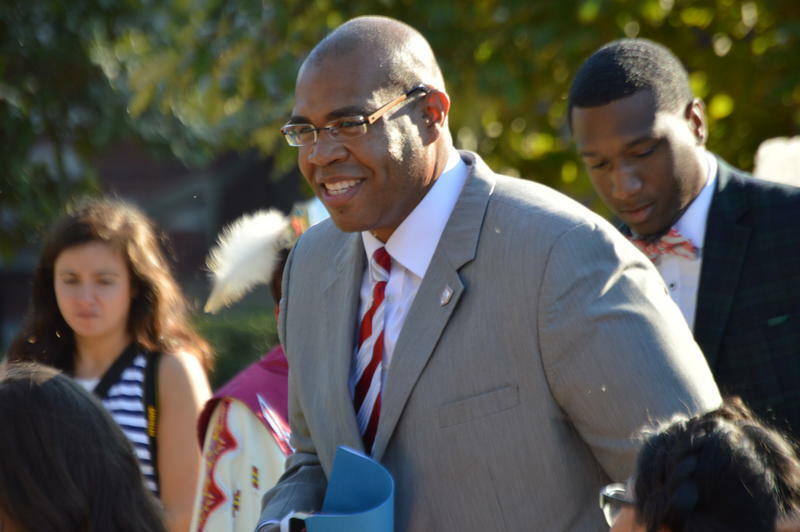 University of Oklahoma Vice President for Diversity Jabar Shumate. Native American students and University of Oklahoma administrators marked the first annual Indigenous Peoples’ Day Monday morning. The ceremony came after the Undergraduate Student Congress passed a resolution last month recognizing the holiday in place of Columbus Day. 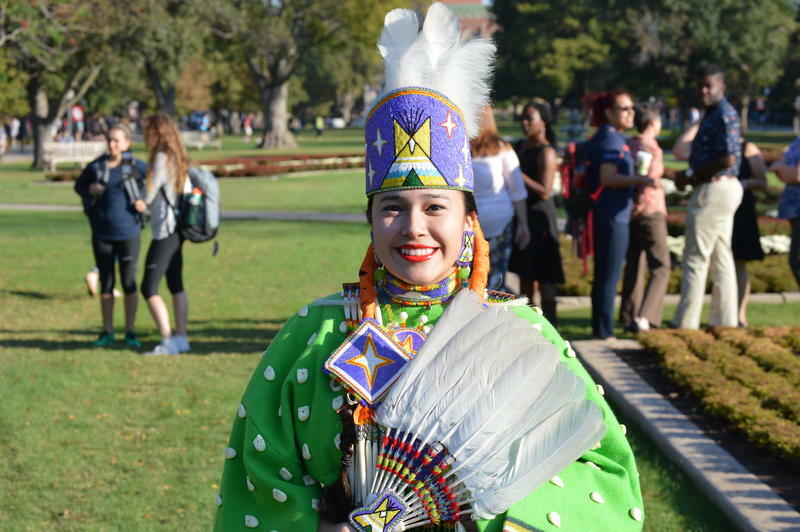 Dozens of students and faculty participated in a tribal flag procession down the main thoroughfare on OU’s campus as drums beat and dancers marched toward the library. 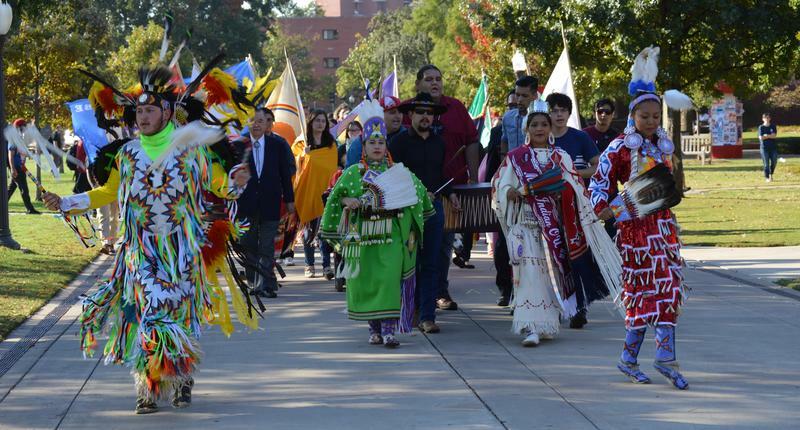 Listen to the entire event marking Indigenous Peoples' Day at the University of Oklahoma. President David Boren said Native Americans have contributed to OU’s culture since its founding, through the arts, architecture, and curriculum. “Today, as we celebrate Indigenous People’s Day, we celebrate especially the fact that in the face of injustice and tribulations and trials, that Native culture and Native American culture has not only survived, it has flourished,” Boren said. He announced Mark Wilson from OU-Tulsa would serve as a newly created tribal liaison under Vice President of Diversity Jabar Shumate, and the creation of a new center for tribal nations to study sovereignty issues. 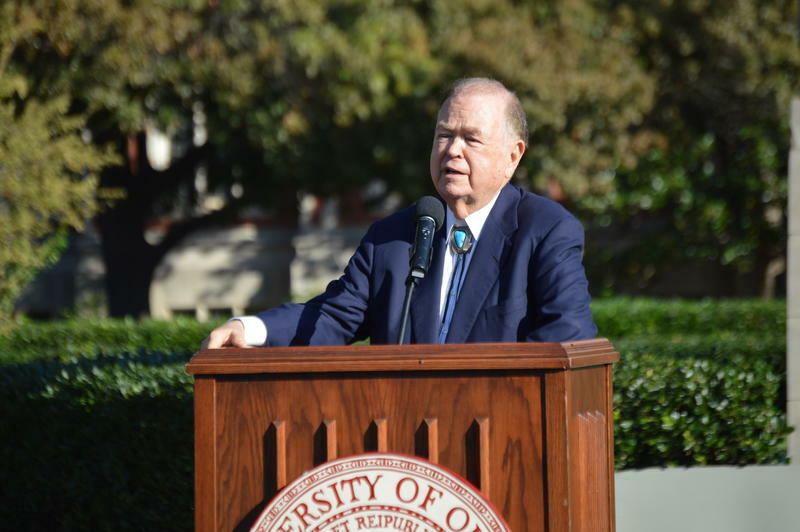 Boren also said pending Board of Regents’ approval, OU’s Native American Studies program would be elevated to Department status in the College of Arts and Sciences. Dressed in a traditional southern Cheyenne elk tooth broadcloth dress adorned with beadwork, University of Oklahoma student Raven Morgan said she’s happy to see recognition of Native culture and heritage. “A day in the fall semester to where we can celebrate and kind of educate our fellow Sooners,” Morgan said. The Oklahoma City Council plans to reintroduce a resolution Tuesday recognizing the second Monday of October as Indigenous Peoples’ Day. Choctaw citizen and activist Sarah Adams-Cornell said she wants to see Oklahoma City follow the example of cities like Albuquerque and Portland. “It’s important that our capital city, home of so many native populations and tribes, be recognized as a city that values all of its citizens,” Adams-Cornell said. The motion failed on a 4-4 tie at the September 29 council meeting. Councilwoman Meg Salyer was absent from that meeting and the vote as she recuperated from a broken leg.